St. Paul Mayor Chris Coleman and Regional Labor Federation Bobby Kasper welcome job seekers and employers to the Union Job & Resource Fair at the East Side Freedom Library. 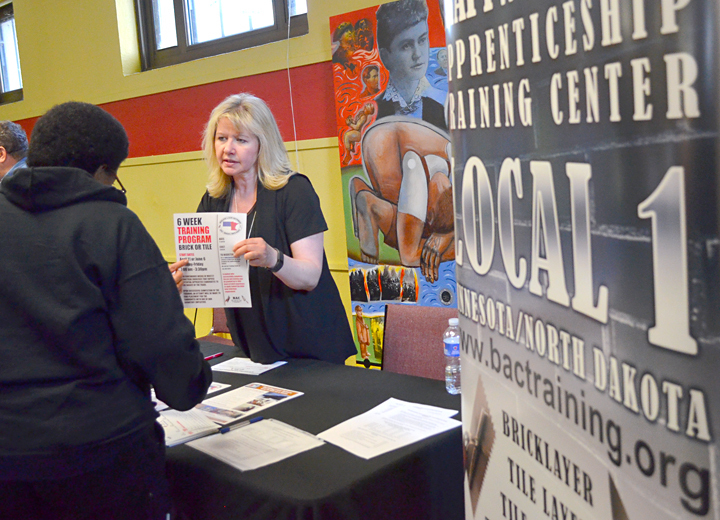 Union employers, apprenticeship programs and community service agencies set up shop on St. Paul’s East Side last night, recruiting talent from the distinctly working-class neighborhood and beyond at the Union Jobs and Resource Fair. Many Latino, Hmong, Karen and East African families call the East Side home, and the job fair, organized by the St. Paul Regional Labor Federation, AFL-CIO, shows local unions are serious about reaching out to communities – particularly minorities and immigrants – underrepresented in their ranks. “This is only the beginning,” St. Paul RLF President Bobby Kasper said. “Too many members of our community don’t know what unions do, or aren’t aware of opportunities for employment in a good, union job. St. Paul Regional Labor Federation President Bobby Kasper welcomes people to the job fair. Jody Paulson offers information on an apprenticeship with Bricklayers and Allied Crafts Local 1. 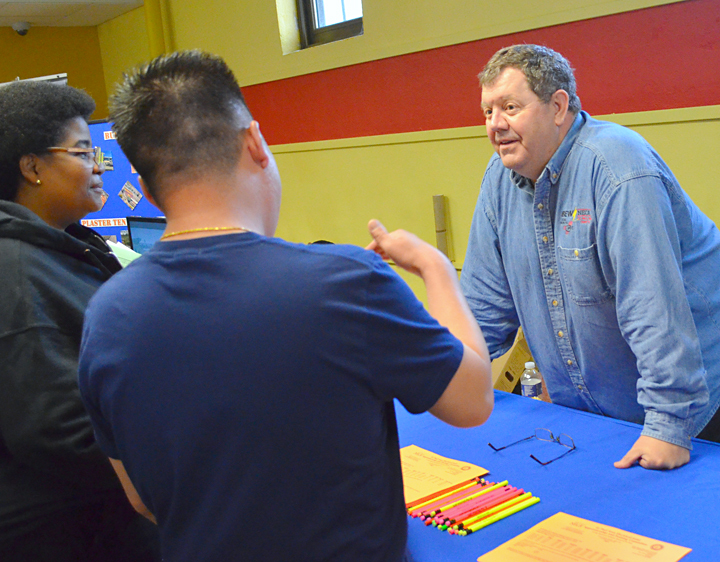 IBEW Local 110’s Jim Grim (R) offers information about a career as an electrical worker. Jose Marrero of the North Central States Regional Council of Carpenters talks with jobseekers. 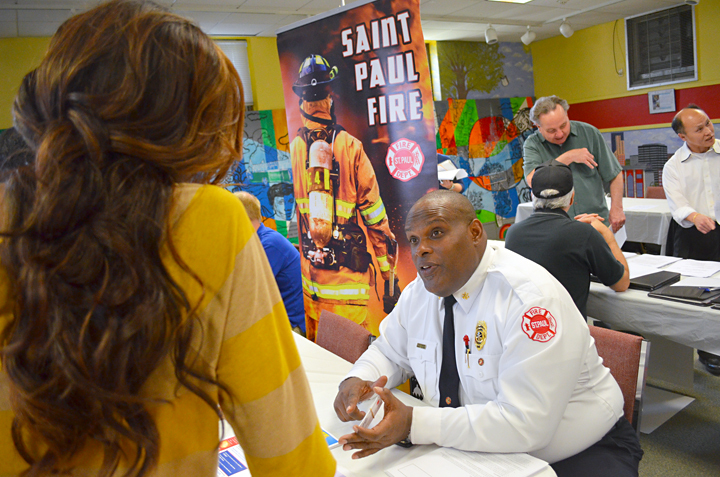 Gerone Hamilton, chief of community relations, represents the St. Paul Fire Department. Matt Ryder of BCTGM Local 22 talks about employment opportunities in St. Paul’s industrial bakeries. 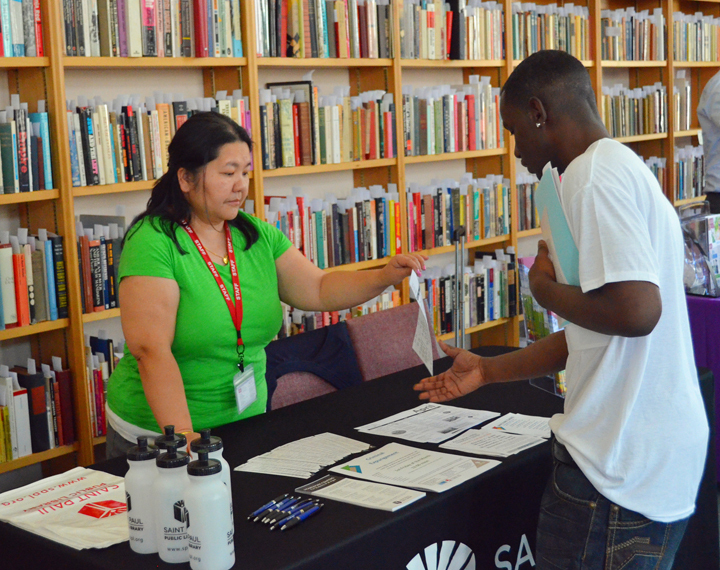 Dua Thao (L) talks about resources available to jobseekers at St. Paul’s public libraries. Mayor Chris Coleman’s remarks open the Union Job and Resource Fair. 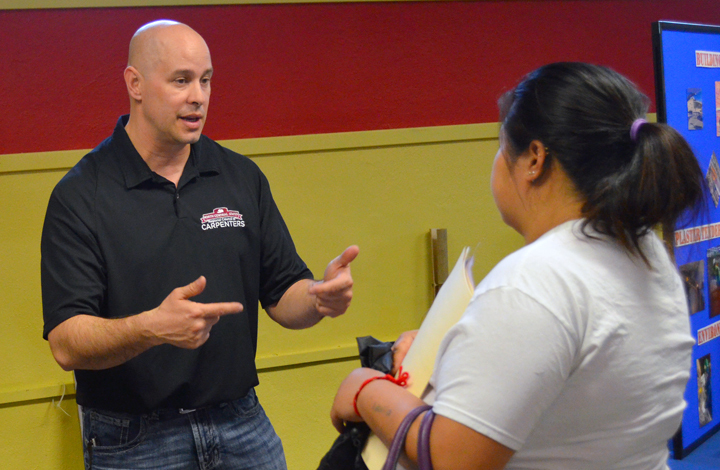 Gary Larsen, a native East-Sider and representative of the Laborers Training Center in Lino Lakes, talks with jobseekers. 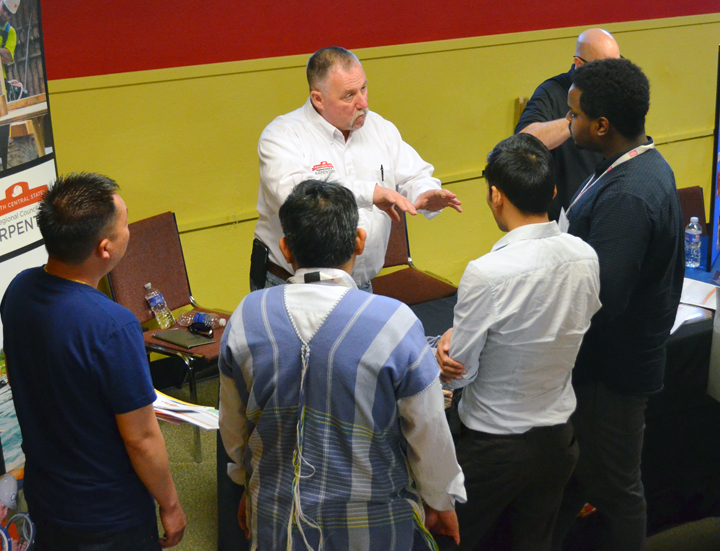 Interpreters fluent in several languages, including Karen, help jobseekers confer with representatives like Rick Dushaw of the Carpenters union. 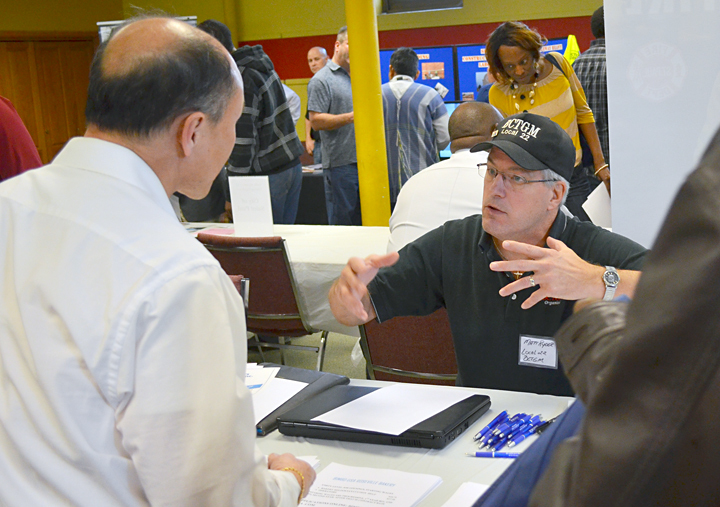 During the fair, held at the independent East Side Freedom Library, jobseekers ducked in and out of booths staffed by representatives of about 20 union employers and eight local agencies, which provided resources on everything from resume writing to record expungement. Ebba Benti, a resident of Frogtown, took home a business card from one of the St. Paul Public Schools’ maintenance managers, who said Benti’s skills sounded like a match for several openings in the district. “I told him what skills I have, what I know, and he liked me, I guess,” Benti said. Ebba Benti (R) talks with a representative of the St. Paul Public Schools, who told Benti his skills made him a good fit for several openings in the district’s maintenance department. The St. Paul school district was among several public-sector employers represented at the job fair. Others included the city’s fire department and water services, as well as the City of Minneapolis. Private-sector employers at the fair included several nursing homes, industrial bakers and Eureka Recycling. 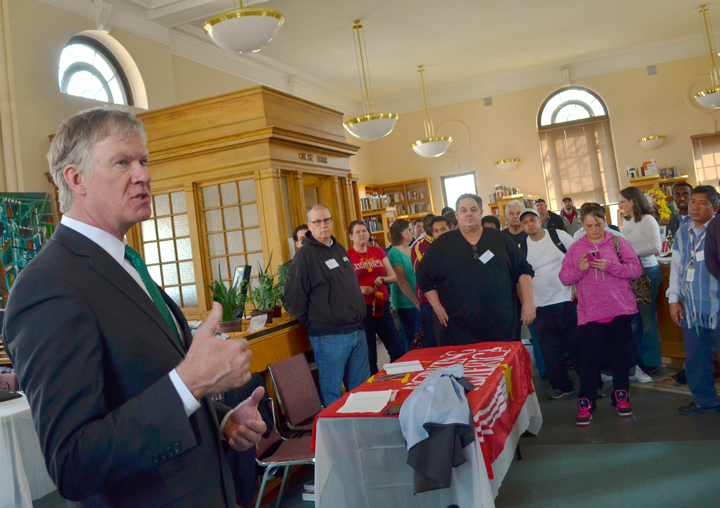 “Jobs are good, good jobs are better and union jobs are the best of all,” St. Paul Mayor Chris Coleman told jobseekers and employers during a brief program to kick off the event. 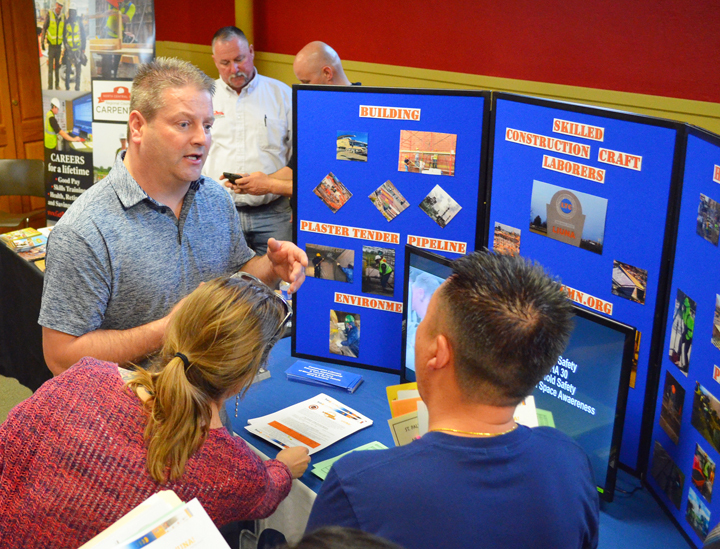 Gary Larsen, an East-Sider since birth, was one of several Building Trades representatives at the job fair promoting their apprenticeship programs. Larsen, a member of the Laborers union, said he was proud to be promoting good, union jobs in his own neighborhood. Apprenticeships in the trades offer workers the potential to earn as they learn, with middle-class wages and good health and pension benefits. Jobs like that were a lot more common on the East-Side when Larsen was growing up, before Whirlpool, 3M and Hamm’s shut down their production plants. 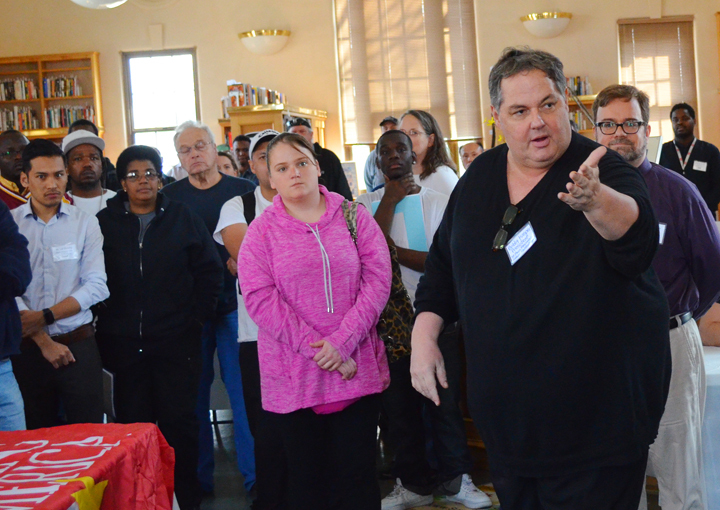 Thanks, everyone, for making the event, our FIRST “Union Job and Resource Fair,” such a success!